Farmington Hills, MI – Logi-Serve™ (www.logi-serve.com), a web-based screening and development assessment and talent management platform, has won Customer Care News magazine’s 2012 Publisher’s Choice Product of the Year Award for its best-in-class and award-winning assessment screening and development technology. 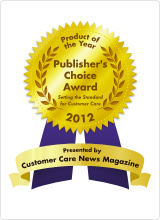 Each year Customer Care News honors the most outstanding customer service products on the market. Logi-Serve, LLC. received this coveted award for its pioneering Logi-Serve™ Service Excellence (Logi-Serve) screening and development tool. Logi-Serve™ was built from the ground up to provide a more precise way to predict and develop service and sales excellence. Logi-Serve™ was selected for its scientifically validated and proven approach to improving the quality of hires and assisting in managing and developing employees specifically around service excellence as well as customer and patient satisfaction. TheLogi-Serve™ reporting engine also provides reports that enable companies to make better selection decisions, and then more easily mentor and develop employees. Additionally, it offers a deep analytics engine that ties results to better business outcomes, including dollar estimates on expected added service value by people recommended by the system. Dr. Keith Levick, associate editor of Customer Care News, calls Logi-Serve™ “a game changing and breakthrough technology” and “ the most scientific and innovative system he has ever seen.” Levick has more than 30 years of experience as a training and development specialist for Fortune 100 companies as well as organizations of all sizes. Levick helps companies design programs to ensure they recruit, train and develop service excellence as part of creating a culture of service excellence. Logi-Serve™ offers two innovative patent pending systems including a Visual Logic™ storyboarding platform and a Triangulation™ science testing methodology that allows companies to assess people more quickly and precisely, pinpointing service ability and predicting performance outcomes. Logi-Serve™ was also ranked a Top 10 “Awesome New Technology” by the 2011 National HR Technology Conference leadership.